The Aztec Empire was a military empire where battles with the neighboring city-states and tribes were common. With the passage of time, these battles became necessary for the steady functioning of the empire because of a steady inflow of tribute and war captives. Due to the importance of war in the Aztec culture, warriors enjoyed a very high status in society which was on par with the nobility. Becoming a great warrior was one of the sure ways of upward social mobility for the commoners. In this hierarchy of the elite warriors of the Aztecs, the Aztec Eagle Warriors were right at the very top. Aztec Eagle Warriors, along with Aztec Jaguar Warriors, formed the two elite orders of the best warriors among the Aztecs. Both these military orders were reserved for the bravest soldiers of noble birth who took the greatest number of prisoners in war. However, sometimes common people who displayed exceptional agility and talent on the battleground were also admitted to the order. The Aztecs considered the eagle to be the symbol of the sun and thus the Aztec Eagle Warriors were the soldiers of the sun. The importance of Aztec Eagle Warriors constantly grew as the empire expanded and most of their lives were spent on the battlefront. Basic military training was part of the education of every Aztec male student. Up until the age of 14, the education was usually supervised by the parents and the calpulli authorities. Their progress was constantly tested by the local temples, and students who displayed exceptional talent were chosen to become future Aztec Eagle Warriors. Most of the students chosen for the order came from the nobility but some of the commoners with exceptional talent were also given the chance to become Eagle Warriors. After being chosen, their military training became more rigorous under the supervision of senior and experienced warriors. Young Aztec men became warriors at the age of 17 and their formal military training and service began from this point. They could accompany the senior warriors on the battleground, although they were kept at the rear. The new inductees in the order were expected to be brave and noble and fight with courage. Recruits who belonged to the nobility were also educated in other disciplines such as religion, history, and politics etc. In order to establish himself as a warrior and attain the adult status, the young recruit had to capture his first prisoner. Capturing of prisoners entailed improvement in the military hierarchy and after capturing 20 prisoners of war for sacrifice, a warrior was eligible to become an Eagle Warrior. 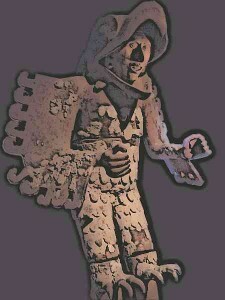 Aztec Eagle Warriors used a variety of different weapons in addition to their unique battledress. Their weapons included bows, spears, daggers, and a spear-thrower called an atlatl. 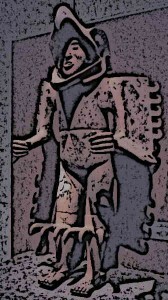 One of the most important weapons at the disposal of Aztec Eagle Warriors was the Aztec blade called “machahuitl”. This blade was made by setting obsidian with wood and its stone was often sharper than steel, although it would lose its edge quite soon. They also used slings made of wool to hurl firestones at the enemy. A lot of Aztec weapons were designed to stun the opponents instead of killing them so that they could be taken as captives. Aztec Eagle Warriors used specific kinds of clothing and costumes which distinguished them from ordinary warriors and represented the order to which they belonged. The most important component of their battlefield uniform was a lightweight close-fitting breastplate. The use of helmets adorned with long eagle feathers was also a symbol of prestige for Aztec Eagle Warriors. Other important components of the battledress and costume of Aztec Eagle Warriors included round and brightly colored shields adorned with feathers and leather stripes to cover the legs. They often also wore heads of eagles including an open beak. With higher ranks in the hierarchy of the orders, the costume of the warrior also became more elaborate. Aztec Eagle Warriors – Becoming a great warrior was one of the sure ways of upward social mobility for the commoners. In this hierarchy of the elite warriors of the Aztecs, the Aztec Eagle Warriors were right at the very top. Aztec Eagle Warriors, enjoyed a very high status in Aztec society and their status was considered on par with Aztec nobility. Other than the Jaguar Warriors, Aztec Eagle Warriors were the only class of warriors who were considered full-time warriors. The Aztec Emperor awarded them with land which was tax-free and any profit made was to be kept by the warriors. The land was awarded for life and could be passed down as an inheritance. Thus once the land was given to a particular warrior, it became his personal property which he could hand over to the next generation. Additionally, Aztec Eagle Warriors could also be involved in politics and had access to food and clothing which was normally reserved for the elite. The famous Aztec House of Eagles was located next to the famous Templo Mayor in Tenochtitlan. It was a place where the Aztec Eagle Warriors gathered during their ceremonies and rituals. 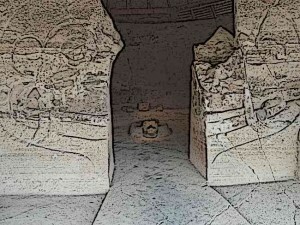 They also indulged in meditation, prayers, and rendered various kinds of offering to the gods. The Aztec House of Eagles was a large complex which consisted of broad platforms with columns in addition to meeting rooms and patios. The House of Eagles was built in 1430AD after the Aztec Empire had been established. It was further enlarged in 1470 during the reign of Emperor Axayócatl. Finally, it was once again renovated in 1500. With the conquest of Tenochtitlan by Spanish conquistadors, Aztec House of Eagles was destroyed in 1521 and the Church of Santiago Apóstol was built atop its ruins. The Aztec Empire was a military empire where a lot of importance was attached to military virtues. Thus the elite warriors of the Eagle Order were among the most respected members of the Aztec society and their status was almost equal to the status of the nobility. Most of these warriors actually had noble descent although some commoners who displayed exceptional military talent were also included. Aztec Eagle Warriors, other than having a highly respectable status, also received large land grants from the emperors which became their personal property and they could pass it down to the next generation.